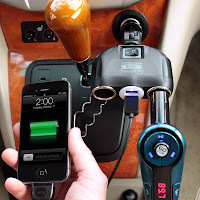 Accessory Genie - Consumer Electronics and Accessories Industry News: Nothing short of 100% charge! Nothing short of 100% charge! Like me, I am sure that any person, who owns a smartphone, MP3, E-reader, or any other USB-powered device, is all too familiar with the happiness you get from seeing your device juiced up at 100% battery power! If you can relate to this feeling, you also know that it is short lived as you begin to use your device and watch the battery life become lower and lower. Because we live in a time where people are always busy and on the go, no one has time to sit around at home waiting for their devices to charge. With the ReVIVE PowerUP 4P Dual USB and Dual DC Power Adapter, you can satisfy that constant need to refuel and stay charged while enjoying the ability to move from place to place! There are two USB and two DC outlets to connect up to four devices simultaneously! This means that your smartphone, MP3 player, tablet and handheld game console can all be charged as you get from point A to point B! Not to mention that your family and friends will love you on those road trips! No more need to worry about people in the car fighting over the sole charger – simply plug it into the cigarette lighter (DC outlet) and let the charging party begin! Thanks to the ReVIVE PowerUP 4P power adapter, the only number you will be familiar with is 100%, aka HAPPINESS!!! I know I always have a smile on my face when that beautiful number is staring back at me. No more waiting around at home to refuel; now I can charge anytime, anywhere! Want to be in the know about more great deals like this? Sign up for our Weekly Newsletter and you'll be the first to know about new products, special discounts, exclusive promotions and more!